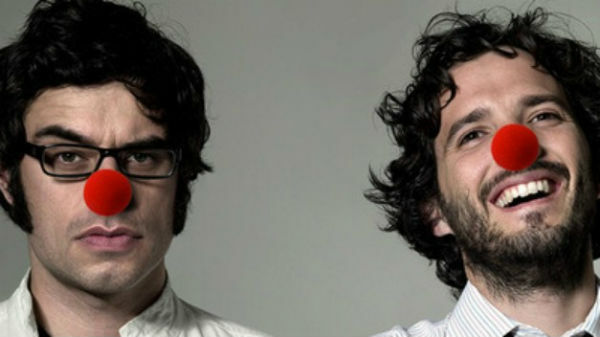 It’s been awhile since we heard from Flight Of The Conchords, the hapless New Zealand folk duo who gave the world such hits as “Business Time” and “Foux Du Fafa.” Unfortunately, Bret McKenzie and Jemaine Clement retired the band in 2009, making the world a far less funny place. But good news; the boys have reunited for charity (because that’s what rock bands do) — specifically, the very real Red Nose Day: Comedy To Cure Kids charity. The fourteen-minute long video for the band’s feel-good new single, “Feel Inside (And Stuff Like That) ” captures a hilarious band meeting with long suffering manager Murray. The “We Are The World”-style song enlists the talents of New Zealand celebrities Dave Dobbyn, Boh Runga, Kids Of 88, and Luke Buda (it’s okay, we’ve never heard of them either). You can buy the “Feel Inside (And Stuff Like That)” single on iTunes; all the proceeds go to Red Nose Day. Like funny songs? Don’t miss our Music and Comedy issue, starring Jimmy Fallon, Tenacious D, Reggie Watts and more.